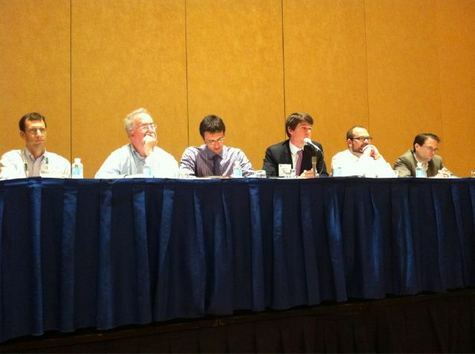 The panel that Henry and I organized on this subject was a lot of fun. Although we had two late cancellations from the very apologetic Anne Kornblut and Jeff Zeleny, Matthew Yglesias of the Center for American Progress and Mark Blumenthal of Pollster kindly stood in alongside Marc Ambinder, Ezra Klein, and Mark Schmitt. In this first post, I’ll report the panelists’ answers to the initial questions I posed: one thing they had learned from political science, one question that they wanted political scientists to address further, and one blind spot of political science. Marc Ambinder blogged some of his thoughts here (see also Joshua Green’s comment). In his post, he cited how much political science had taught him about the nature of political independents, and in particular how many of them are essentially closet partisans. In the panel, he noted that Mark Blumenthal had taught him that robo-polls cannot be dismissed out of hand. 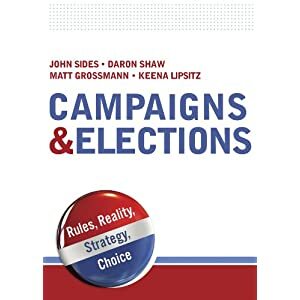 Matt Yglesias, like Joshua Green, lauded the political science critique of realignments, especially David Mayhew’s book. Ezra Klein emphasized how valuable he found political science’s focus on structure and institutions and, concomitantly, how often political science showed that “trivia” doesn’t matter. Mark Schmitt noted how much he had learned from rigorous research about campaign finance, and how it had qualified some of his concerns about money in politics. Mark Blumenthal simply noted that without his undergraduate political science degree (from the University of Michigan), he wouldn’t have had the career that he has. Matthew Yglesias wished for more research on primary elections, and especially open-seat primaries. Ezra Klein turned the question on its head. Political science, he said, should tell journalists what questions journalists should ask. He noted, for example, that despite extensive debate on term limits for Supreme Court justices, he never thought to quantify the length of terms a la the Crowe and Karpowitz research I previously discussed. Mark Schmitt’s answer spoke both to this question and to the “blind spot” question: he wished that political scientists had more to say about why big things do happen in Congress (e.g., FinReg). In other words, how do we get to something other than the “equilibrium state”—by which I think he meant relatively incremental policymaking? Mark Blumenthal wanted more research on elections other than presidential elections, as well as more research on emerging patterns of news consumption, particularly of ideologically slanted media. The lived experience of politics and the academic representation of it often differ. Yglesias noted that there is much less research on the behavior of members of Congress outside of roll call voting. Klein argued that political science’s blind spot is, well, the value of political science. His impression was that political scientists would rather not explain their research and, compared to economists, seemed to lack a certain self-confidence. Mark Schmitt amplified this, noting that even when economists disagree they “show their fights well”—and the resulting debate helps outsiders learn to grapple with the questions that economists are struggling to answer. I saw this as a useful corrective to the instinct (which sometimes I have as a blogger) of downplaying debates or avoiding research questions on which there are significant debates. The issue of self-confidence is one that I will return to in subsequent posts on the panel. Was the panel recorded and broadcast?